KwikTic can communicate with shopfloor equipment to control Routing, Prevent Errors, Ensure Processes are Set Up / Controlling correctly. KwikTic can also collect and log process settings, Defect, Repair and Test Results. Standard Interfaces allow data to be push directly into KwikTic from anything with a network connection. KwikTic can provide interfaces to link other systems to a Network connection – enabling them to talk to our Standard Interface. Combine this capability with all the manual processes KwikTic can handle and you all aspects of production can be monitored, controlled, planned and records maintained. 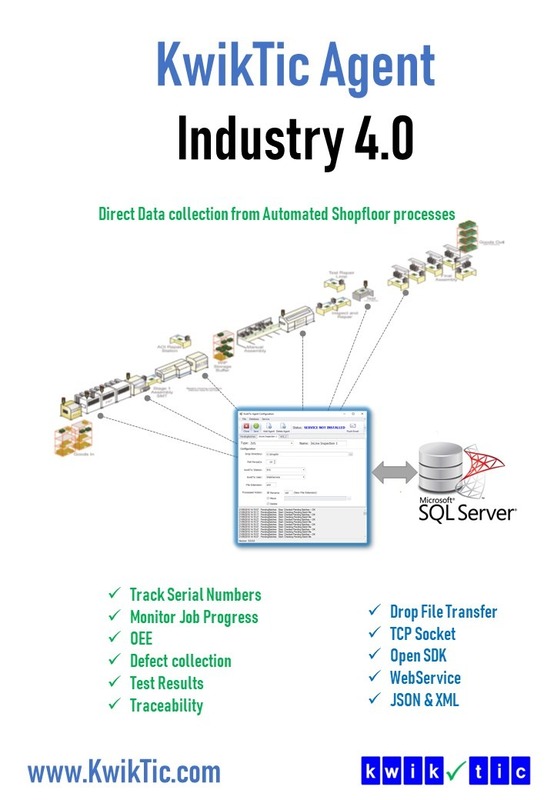 Add a Batch (Production Order) with Serial Numbers – This could be required to synchronise with and MRP / ERP system. 2. Log a Test including Results of Individual Test Steps and Values measured.